I am going to help you choose the best safety cover for your inground swimming pool. I will do this by explaining the different types of safety covers, brands, what they cost, warranty, Pro’s and Con’s, and finally installation costs. I have compared all the materials from each of the manufacturers below, and in my opinion, one heavy grade solid cover is the same as another. The 95% mesh is the same as any other brand, and 98% mesh is the same material as every other manufacturer. I am pretty sure they are all buying materials from the same supply companies. These brands are the top five best pool safety cover manufacturers on the planet. I considered, inspected and evaluated 10 companies before settling on these. Dollar for dollar, you can not do better on price or strength than the two companies I recommend in this article. I recommend two companies because one cost less for stock covers (rectangles), while the other cost less for custom covers (kidney and lagoon style). I do have a marketing agenda, I want to sell you a cover! But, I promise you this: I am not trying to steer you to any specific manufacturer because of margins (potential profit). I am just giving you the facts as I know them, and hopefully we can do business on a cover. I am going to tell you point blank – What I would put on my own pool and why. I think by the time you are finished reading the facts and my opinions, you will realize a couple things 1. I have a lot of of experience, and 2. You feel much more comfortable choosing a cover. For the longest time I exclusively sold Loop Loc Safety Covers. They’re know for Bubbles the elephant walking on the cover. They basically invented the market along with MEYCO. For many years I was a snob about new safety cover companies that came along after, I basically looked at new companies as making knock-off pool covers. I was guilty of contempt prior to investigation, that is until a few years ago when I started looking at the competition. I often recommend their Ultra Loc with Drain panels. One of the best things about Loop Loc is that they have the most stock size covers. So for others, a pool that is 15×30 would require a custom cover (more expensive. Not so with Loop Loc, they have that size, and many others. Loop Loc has decided not to sell a high shade / 98 mesh cover. This is because they are so dense that they don’t drain as well as 95 mesh. 98 mesh cover are known for clogging with dirt and pollen. Loop Loc does not sell a extra strong spring for their covers. Again this was a choice made at Loop Loc. They know that the years when we get a lot of snow, it is better that the spring break rather than their cover rip. I have actually seen covers saved, because the springs let go. I personally like the Ultra Loc with drain panels. Meyco pronounced “my-co”, as mentioned above invented the first safety cover back in the day. They’re still selling quality covers like Loop Loc. Except they now also sell a 98 Mesh (Rugged Mesh). I like their covers but they are usually more expensive than others with no advantage in materials or warranty. Latham is a great company and has good quality covers. They sell mesh similar to Loop Loc, and a heavy grade sun blocking mesh also. Along with a large variety of stock sizes, and selection of colors. Latham has a couple advantages: One; It’s a large selection of stock pool covers. Two; They make the least expensive premium mesh (now called 7000 mesh) stock covers. When you compare a stock 98 mesh pool cover, price, and quality- Lathem vs. any other brand, Latham is usually the least expensive. This company has continued to innovate and bring new products to the industry. They currently have a commercial grade mesh cover that is the strongest mesh on the planet. They have helped dealers like me with visa gift card incentives (Strive for five). I get a $150.00 dollar gift card for every five covers I sell. They have a 72-hour shipping policy on all stock covers. They also provide a flat rate shipping cost of $40.00 anywhere in the United States. GLI is very smart in offering a repair or replacement safety cover program. If a customer calls me and says they want to repair or replace their cover, GLI sends a box to the customer with paid return shipping, so they can mail the cover to GLI. GLI checks the cover and offers a repair price. If the cover is beyond repair, they offer to make an exact replica so it fits existing deck anchors. They will do this with any manufacturers cover. GLI also has a complete line of safety covers, from the super light (yuck), to their extremely durable pro-mesh, to the best mesh cover money can buy. Merlin has a good company, I have not used them much as other manufacturers are usually less expensive and convenient. With an average ticket price of roughly 3ok, they too expensive for most people. They do however offer the following additional benefits over traditional safety covers. You can keep your pool open during the cold winter months, even in the northeast. You can quickly and easily secure your pool during the season. Include privacy glass for year round privacy. If you choose to winterize your pool, you can: reopen pool in spring super fast and easy, monitor and treat water, and eliminate having to pump out water. Winter Spa enclosures cost an average of just 10k. There used to be three ways to cover a pool for the winter: Plastic tarp with water bags, mesh safety cover, and solid safety cover. Now there are a few variations of mesh and solid added to the mix. I have added another type of safety cover called a retractable enclosure. Tarps come in two types, solid and mesh. These covers sit on top of the pool water and are held in place with water bags or tubes placed around the perimeter of the pool. some people hold these covers in place with bricks, stone, and twine. You can buy a tarp and water bags for just about any size residential pool for less than $250.00. Also, if you take care to remove all debris and water off the cover before opening the pool, the pool water should be clean and clear. These covers are not very durable and need to be replaced every 2-4 years. Some water bags will have to be replaced every year. It requires a lot of work to remove all debris and water from this cover when opening pool. These covers are not safe and pose a great danger to children, elderly, and even pets. Experiment – Place your hand in a plastic shopping bag and make a fist, then submerge it just 8 inches into your pool or bathtub, then try to open your hand. 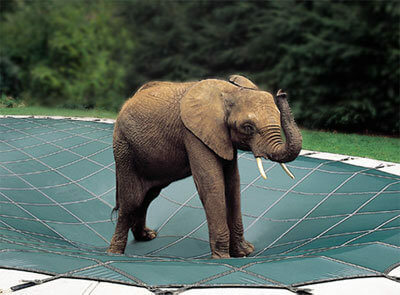 This is to demonstrate what it would be like if you fell in your pool with a tarp cover on it. There are several types of safety covers; Mesh (most popular), Solid, and Solid with drain panels. There are now three types of mesh: Super light, 95 Mesh (standard), and 98 mesh (premium). Each type of safety cover has its own pros and cons. Of all cover types, there are a couple of variations. The first variation is grid size; 90% of all covers are either 3′ x 3′, or 5′ x 5′. As you look at this safety cover picture below, take notice of the grid pattern, covers with smaller panels/grids are the strongest. The next variation is stock versus custom. All cover manufacturers “stock” covers for common pool types and sizes. This is a stock cover above, and like most stock covers, has a 5 foot by a 5-foot grid pattern. Covers that need to be custom measured and manufactured, are usually made with a 3′ x 3′ pattern and cost more. Manufacturers make stock covers mostly for rectangle pools and rectangle pools with steps. Kidney shaped pools and non-standard shapes need to be measured for a custom made cover specific to that pool. As previously mentioned these are the most popular, and least expensive of all safety covers. Water passes through these covers and blocks debris from getting in the pool. These are great durable covers that last as long as 17 years. They are easy to put on and remove. There is no standing water for bugs to collect and breed (mosquitoes). They provide peace of mind for parents and pet owners. These covers weigh less than the other safety cover options. The thinner 95 mesh allows quite a bit of dust and sunlight through. Algae growth, and dirt coats the bottom of your pool. Because all water gets through, you may have to pump some water out of your pool, if we get a lot of rain before the temperature drops (you don’t want the freeze line on your pool tile or light). Mesh 98 Con is that they do not drain as good as less dense mesh covers, and clog with dirt and pollen. Solid safety covers are not hard like you might think, they fold up same as a mesh cover for storage. They are called solid because they do not allow water to pass through. Solid covers require a pump to remove melted snow and accumulated rainwater. These covers keep out all water and dirt and block sunlight that will grow algae. They are stronger than 95 mesh covers. These covers cost about a thousand dollars more than regular 95 mesh covers. They are also heavier and harder to handle. You need to use a pump, and you can’t leave the pump on the cover once the temperatures drop below freezing. You will have to re-install pump again when ice thaws and there is standing water (freezing temps can damage pump). Solid covers with drain panels offer all the benefits of a solid cover without the need for a pump. It does not let much dirt into the pool and blocks algae from growing. Does not require a pump. Usually, cost $750.00 more than a standard mesh cover. It is harder to carry and manage than a mesh. The safety cover market has become very competitive, so fortunately for you, prices are coming down. The cost of installation ranges between $250.00 and $600.00, with the average cost probably being around $350.00. If you have a stamped cement deck, I would include another $100.00 for trim rings. Stamp concrete decks tend to chip a lot when drilling holes for the anchors. There are two types of stamped concrete in my opinion. Those that have cracked and those that are going to crack. If you have patio stones, you can include another couple hundred to cover the cost of the 15″ aluminum anchor tubes that are needed, and sometimes, another 1 or 2 hundred for cement and labor to secure every third or fourth pipe for safety. Installing custom covers cost more than installing stock covers, mainly because installing custom covers requires a lot more drilling. Custom covers usually have a smaller grid pattern and a lot more anchor points. Larger covers generally have more anchor points and more drilling too. Large free form covers have the most anchor points. All these companies offer the same “Prorated” warranty (puke /garbage). After just 2 years, they are almost useless. Never buy anything in the pool world because you like the warranty. If there are any manufacturers defects you will be good. But even during the first two years, you have to pay to ship the cover in for inspection. 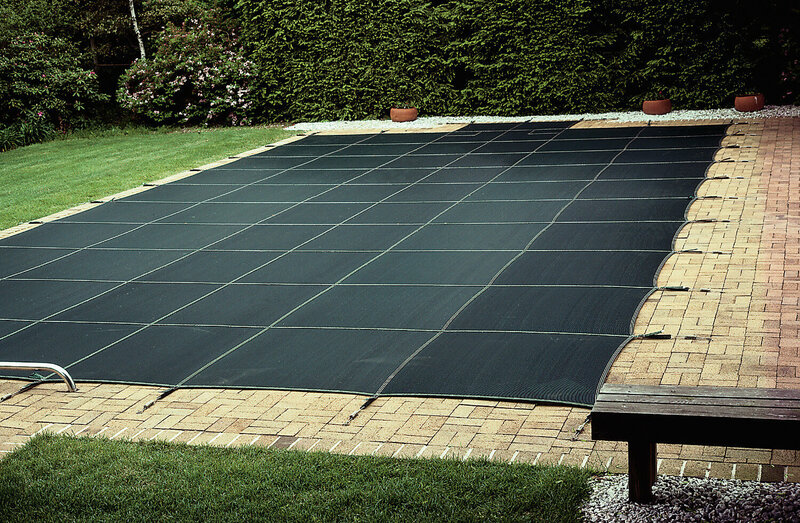 If your pool cover gets caved in by snow or ice. Your warranty will do you know good, as that would not be a manufacturers defect. All these companies have the same basic 2 years prorated warranty. So there is no advantage to buying one cover over another. Here in Massachusetts, we have a tax free holiday every year. At this point, if you live out of state, you don’t have to worry, if you buy your cover from me. We only collect taxes for Massachusetts customers. Massachusetts orders must be paid in full before the end of the tax holiday. Bubbles the Elephant (Loop Loc Mascot) walked on the original 95 mesh, the only thing I didn’t like about the 95 mesh was how much algae grew during the offseason. If I were buying a new cover today and owned a kidney-shaped pool (free form), there is no doubt I would buy a solid with drain panels. If I owned a common rectangle pool and could buy a stock cover to fit it, I would probably still buy a solid with drain panels. If I were buying a 95 mesh or a solid with drain panels in 2016, I would probably buy from Loop Loc. If I were buying a 98 high shade mesh, I would probably buy a Latham Pool Cover. Latham has the least expensive premium 98 mesh stock covers. I hope now after reading these pool cover reviews you feel more confident in your ability to choose the right safety cover for you. I encourage you to reach out to us via our contact form with your pool width and length for a free email quote. Just measure from inside pool wall to inside pool wall.